Are Bumpers Expensive to Fix? Whether you accidentally backed into a pole or your bumper got scratched by a grocery cart, a little bump or dent can be a big deal. Taking your car into an auto body shop, going through insurance, and waiting for the repair to complete is such a hassle. Is it worth your time and money? We believe you deserve a car that looks great at an affordable price, without compromising your convenience. Our mobile auto body repair services cover anywhere between Riverside, Los Angeles, all the way down through south Orange County and Laguna Niguel. Here is a run-down of what it would cost to fix your bumper. Each year, there are about 10,000 bumpers that are replaced and thrown out into landfills. However, more often than not, replacing the bumper is unnecessary! Many auto body shops will replace bumpers despite this because it’s easier and makes them more money. Bumper replacements are only necessary when the bumper is severely damaged and the total cost to repair it is higher than a replacement. Replacing a bumper could cost anywhere between $500-$700 for labor and $385-$925 for parts at an auto body shop. The cost is usually dependent on the year, make, and model of a car, as well as the body shop’s labor cost. With Bumper Buddies mobile auto body repair services, we never want to overcharge our customers or take the easy way out. If we think your bumper should be replaced due to extremely heavy damage, we will order your bumper for you online, install it and paint it for you, usually for about $500-$600. PDR – Paintless dent repair is a method of removing dents without paint damage. Using specialized tools and a little bit of heat, your mobile body shop technician will pull out the dent and restore it to its original form. PDR usually takes about 1-2 hours and costs about $150-$250. Traditional Dent Repair – A traditional dent repair with Bumper Buddies takes about 3-4 hours and will cost, on average, $250-$350. Our technicians pull the dent out by using specialized tools, smooth out the area, and then paint the damaged area with PPG Paint. Scrapes & Scuffs – When it comes to scrapes and scuffs, our mobile repair shop techs will buff the area, use a filler to smooth it, and then sand it down. The last step is to paint the bumper. The whole process will be about 2-3 hours and may cost $250-$350 to repair. 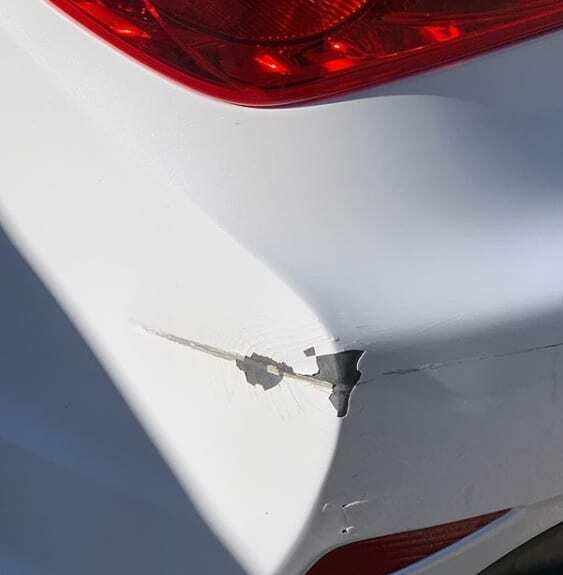 Cracks – Cracks are minor fractures or splits in the bumper, which Bumper Buddies can fix by filling in the crack with a plastic filler and sanding down the area until smooth. Once the filler is dried, we’ll paint it. On average, our bumper crack repair costs $325-$425 and takes 2-3 hours. Holes & Punctures – Holes and punctures in the bumper cost about $325-$425 to fix with our mobile repair shop. Our techs smooth out the damaged area and then use a strong adhesive to patch up the area from behind. We’ll fill in the area, smooth it out, and then paint it. This process takes 3-4 hours. Getting your bumper repaired with Bumper Buddies is transparent, simple, and hassle-free. Our mobile body repair services include free estimates that require zero obligation. If you’re in Riverside, give us a call today for your free estimate at (909) 479-6868! https://bumperbuddies.com/wp-content/uploads/2019/01/before1.jpg 575 563 idgadvertising https://bumperbuddies.com/wp-content/uploads/2018/05/BumperBuddies-Logo-02-1030x485.png idgadvertising2019-01-31 16:47:212019-01-31 16:47:21Are Bumpers Expensive to Fix? Why You Should Use a Mobile Bumper Repair Service in Los Angeles Why is Repairing a Dent on a Tesla so Expensive?